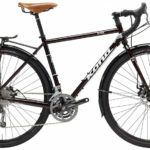 The Kona Sutra touring bike has evolved really quickly into one of the best touring bikes on the market. 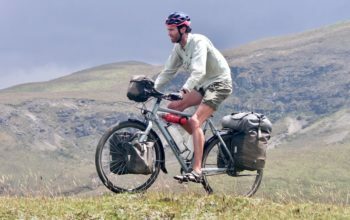 It’s pretty hard to flaw with its steel frame and fork, great touring geometry, wide gear range, number of braze-ons, cable disc brakes, barend shifters and Brooks B17 saddle. 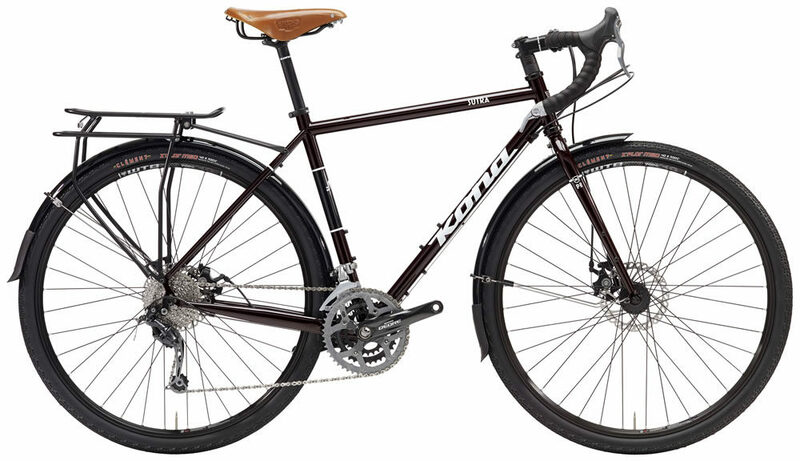 If all those features aren’t enough, Kona go the extra yard and throw in a rear rack and fenders to get you going! Last model year we saw significant changes to the Kona Sutra. The geometry was tweaked to reduce the bottom bracket height, increase the fork rake, employ a uniform headtube angle across all sizes and increase the length of the chainstays. If that information doesn’t make much sense to you then this will: the Kona Sutra is more stable due its lower centre of gravity, longer wheelbase and slightly slower steering. This year, the Kona Sutra has received a minor visual update. 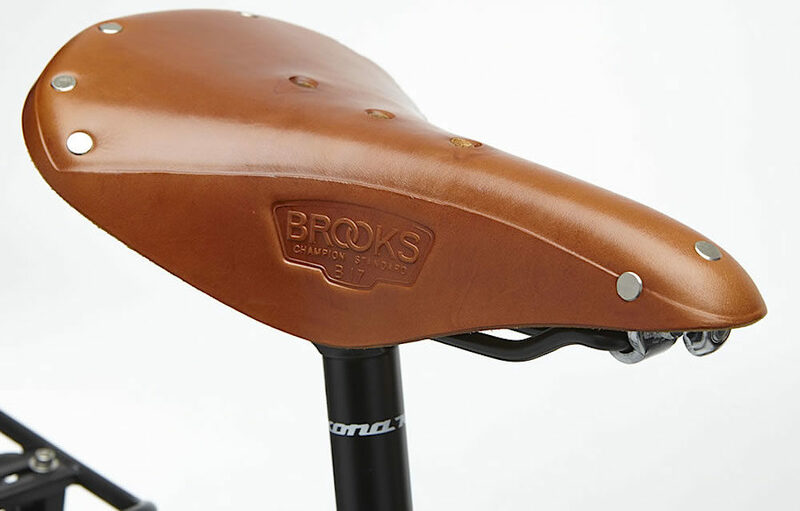 The bike now comes in gloss black with a honey-coloured Brooks saddle. 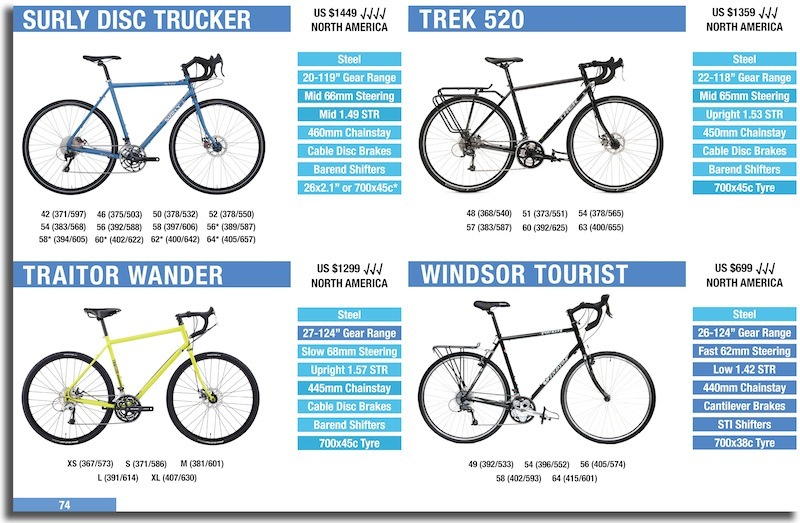 The 2017 Kona Sutra has received a very minor update. 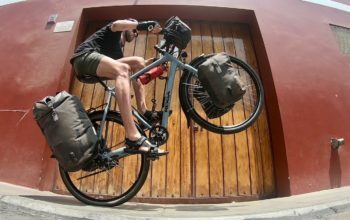 As the Sutra is Kona’s long distance touring bike, the specification is designed with both longevity and reliability in mind. That means barend/friction shifters over STIs, and cable disc brakes over a hydraulic system. Kona have also used their own handlebar that offers a little bit of flare for your comfort. The 2017 Kona Sutra features the ultra-reliable barend shifters. 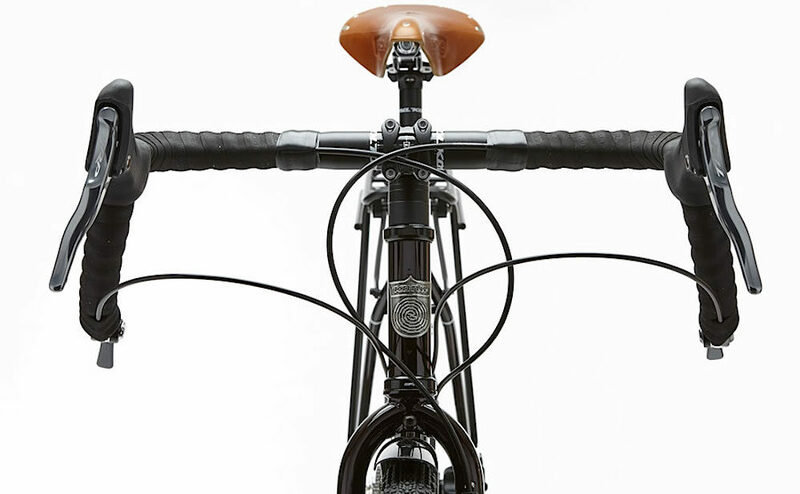 There are braze-ons on the steel fork for either a front rack, porteur rack or two-boss cargo cages. Two bidon braze-ons are found inside the frame and a third braze-on is located under the downtube for a fuel bottle or additional water. The fender struts have been neatly bent to clear the front Hayes L-Series disc caliper. 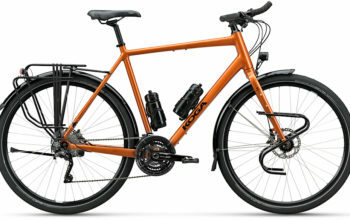 The Kona Sutra has fork braze ons for a front rack or cargo cage. Tyre clearance on the Kona Sutra is 700x40c with the fenders, or 700x45c without. 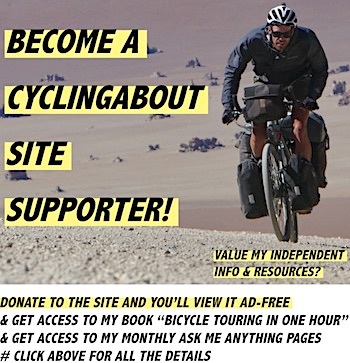 The bike is spec’d with Clement X’Plore tyres which are best suited to dirt roads, so if you’re doing road touring it’s a good idea to check out better alternatives from Schwalbe. The gear range is a highlight on the Kona Sutra. The lowest gear is 21 gear inches, and the highest is 119 gear inches. 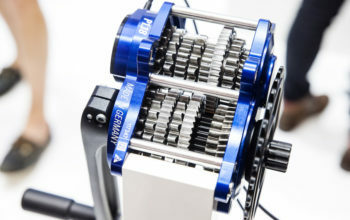 With gears that low, you’ll be able to go up 10%+ grades with all four panniers, and still have the gears to pedal at 60km/h with a big tail wind. 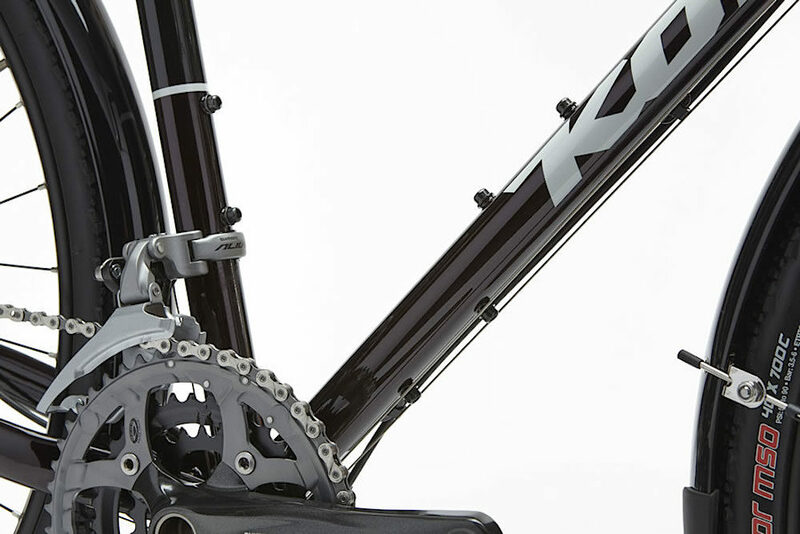 The Kona Sutra has three locations for bottles, five if you include the fork mounts. 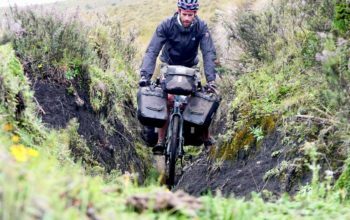 Unlike many touring bikes, the 2017 Kona Sutra comes with a saddle that you’re unlikely to want to change: the Brooks B17. This leather saddle is famous for its ability to mould to your body shape, its ‘hammock’ design flexing to absorb bumps and chatter from the road. It’s also one of the only saddles that people find comfortable without cycling shorts! 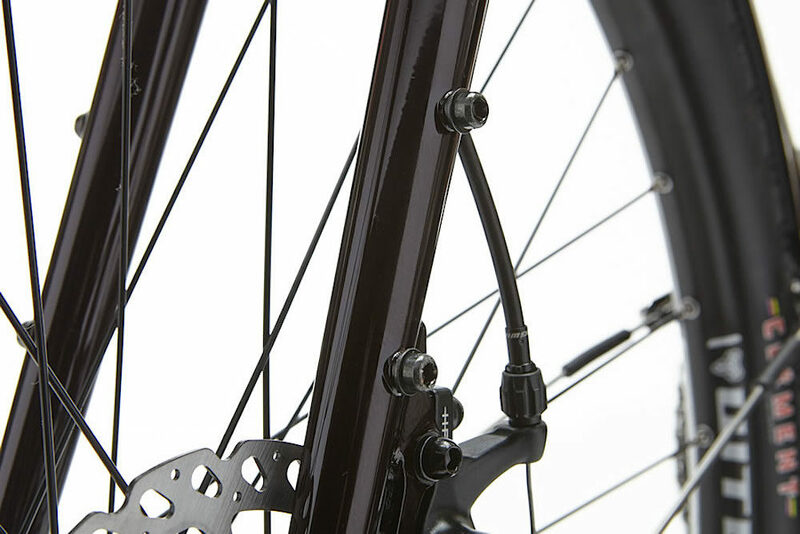 The Kona Sutra has featured the Brooks B17, a touring favourite, the past couple of years. Overall, the 2017 Kona Sutra is an amazing deal for US $1499. 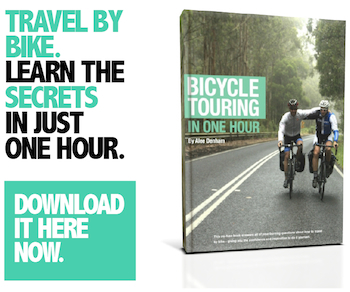 Given that it comes with a rear rack, fenders and a Brooks B17 saddle, it’s an even better deal.